Throughout the year 2015, the Community celebrated the 75th anniversary of its foundation, inviting people to remember its founder, Brother Roger, 100 years after his birth and ten years since his passing to into eternal life. 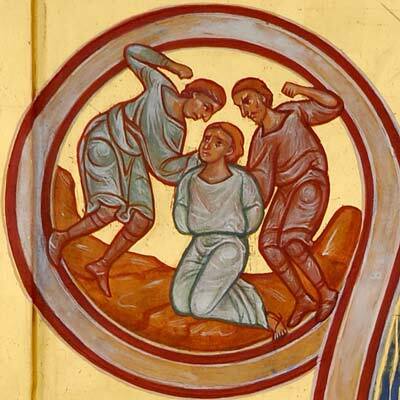 The theme specially proposed for reflection during the year was “Towards a new solidarity”; and the Community decided to have an icon painted telling the story of the Good Samaritan. This Bible text from chapter 10 of St. Luke’s Gospel gives a clear example of solidarity put into practice. 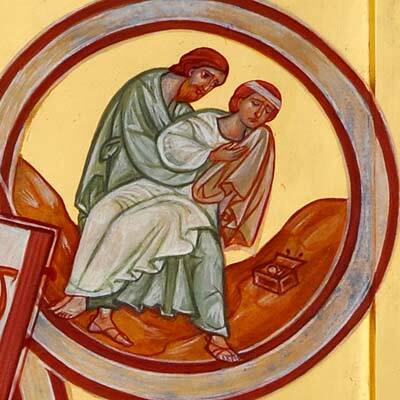 The icon was made by the Icon Workshop of St John of Damascus in France. 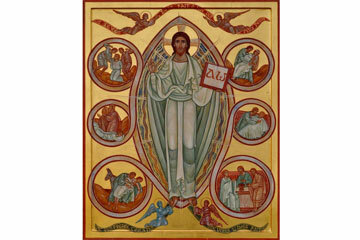 The main person visible on the icon is Christ, standing in the centre. His figure is elongated and wears a garment coloured white with a greenish tint. The most significant part of the figure is his kind and welcoming face. With his right hand, he makes a gesture of blessing, and in his left hand he holds an open book of the Gospels showing the Greek letters alpha and omega. Christ is surrounded by a long halo or mandorla made up of deep blue and red bands and of white and gold lines that give its surface mandorla an undulating movement. A thick white band forms the mandorla’s outer edge. This band does not just follow the outline, but twists outwards into loops that make six circles placed regularly around the edge of the mandorla. Within these circles, the parable of the Good Samaritan is represented in six episodes. So from top to bottom and from left to right, the images on either side of Christ recount the gospel passage. The first image shows the robbers attacking their victim. In the second, we see the victim lying on the ground, as the priest and the Levite pass by on the other side in prayer, but leaving the victim on the roadside. 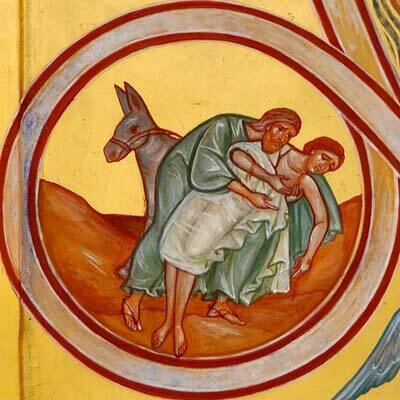 Then the Good Samaritan arrives with his donkey, leans down to the man and lifts him up. He tends his wounds. 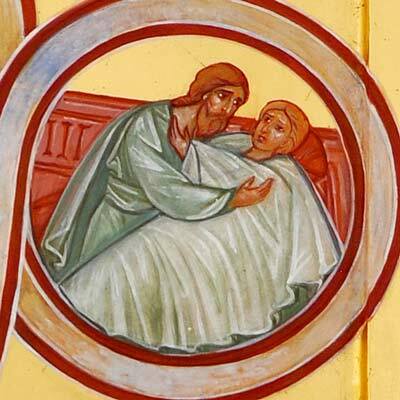 At the inn, the wounded man is in bed, and the Samaritan stands beside him. In the final image, the victim, the Samaritan and the innkeeper are seated together sharing a meal around a table. Above and below the mandorla with Christ at the centre, four angels are depicted worshipping God. Three are in red, and the last is in a greenish blue. At the very top, behind the angels, is a red ribband with a waving movement, and at the bottom, behind the angels, is a green ribband. On the ribbands are the words (in French) “Whatever you have done for the least of my brothers or sisters you have done for me” (Matthew 25:40). Christ, dressed in white, is the heavenly Christ, transfigured, as he will come at the end of time. By his presence he blesses us and he tells us the story of the Good Samaritan. The mandorla signifies the mystery of God that is beyond our understanding. But, dressed in white like a newborn child, Christ comes to us and reveals God to us. In the images telling the parable story, the victim is also represented clothed in white: Christ is present in the wounded person who needs our help. In several of these images, the position of the victim echoes moments of Christ’s passion (the scourging, the taking down from the cross). 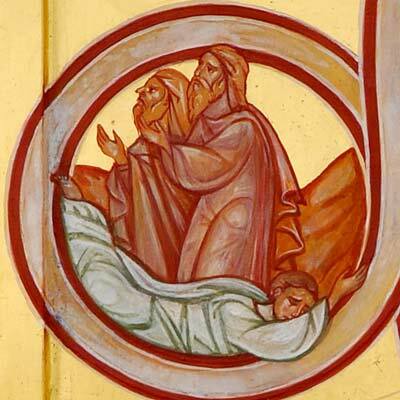 The good Samaritan is dressed in green, a colour that symbolizes the presence of the Holy Spirit. It is true that it is not easy to come to help those who are in need, but if we begin to do so, the Holy Spirit comes into us and works through us. In the first image, three figures are visible: the two robbers and the victim they are attacking. It is the image of a disfigured trinity. Recalling the story of the murder of Abel by Cain at the beginning of the Bible, the parable begins by showing harmony broken by sin. Humanity, though created “in the image of God”, is no longer in his likeness. In the last image, again we see three persons. 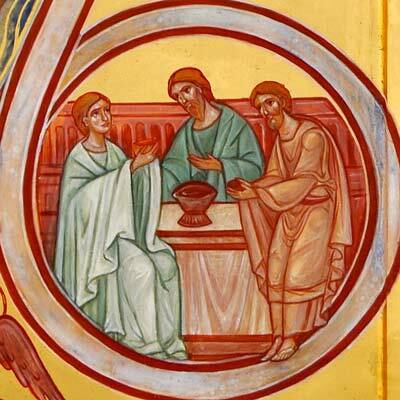 They are sitting around the table, on which stands a cup – as on the icon of the Holy Trinity: the Trinitarian harmony has been re-established. While a piety that forgets one’s neighbour, like that of the priest and the Levite who pass by the victim, is only a form of idolatry, love, the work of charity accomplished by the good Samaritan, restores humanity to the likeness of God. The icon was made using the traditional iconographic technique handed down in the Orthodox Church: egg tempera and gold leaf on a wooden board covered in lefka (a white chalk-based gesso). As in most icons, the representational style is essentially that of Byzantine art. But since the art of the icon is not a gift reserved solely for the Christian East, different elements of the Western artistic tradition, especially that of the Burgundy region, have been introduced into the figure of Christ and to the composition as a whole. So the Christ figure recalls the image of Christ in glory in the Chapelle des Moines at Berzé, or Christ as he is represented on the tympana of Romanesque churches such as Vézelay. The composition as a whole, with the bands springing from the mandorla, is inspired by the art of manuscript illumination. From the artistic point of view, the interest of this icon is in the fact that it is not a copy of a traditional image, but a new representation. It is a new image, born from reflection on the parable of the Good Samaritan, whose forms and colours reveal aspects the gospel with a new freshness. So the icon is a part of a living tradition in which the Holy Spirit enables us to keep rediscovering faith in a new way.